Since LinkedIn’s IPO in 2012, the company has grown its market cap by 6x and as of this writing is worth about $27.5B. 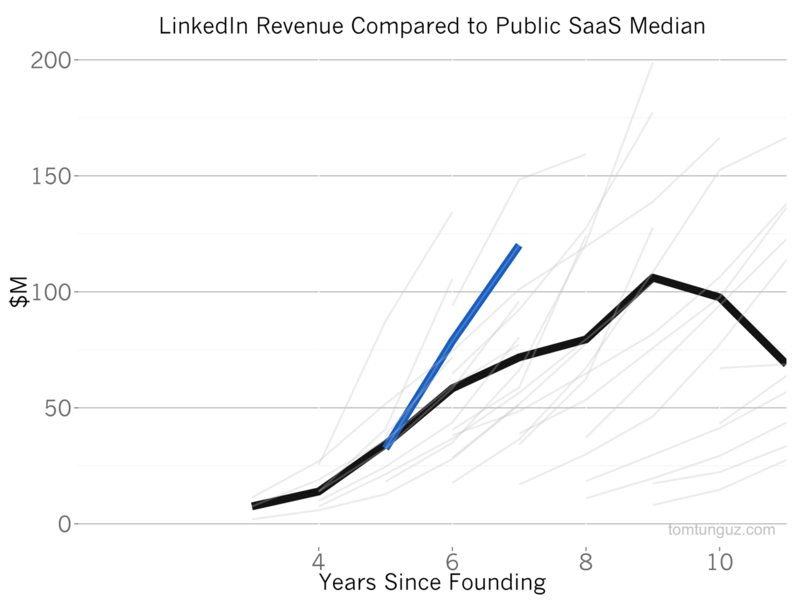 Second to Salesforce, LinkedIn is the second largest SaaS company in the world. 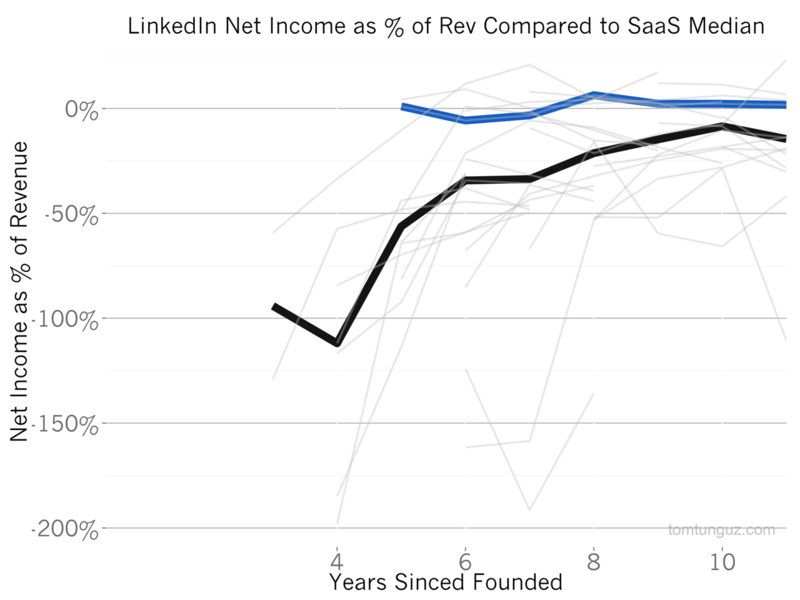 Unlike most SaaS companies which are B2B, LinkedIn is a B2C2B company. LinkedIn attracts hundreds of millions of consumers to post resumes online and sells this data and access to its audience to advertisers and recruiters and salespeople. The intrinsic data and people network effects of the business create reinforcing feedback cycles that have helped the business achieve tremendous revenue growth. By every measure, LinkedIn is a remarkable business. It’s one of only two SaaS companies to break the $500M in annual revenue mark and has done it with an incredible growth trajectory, tripling that number is two years, as the chart above shows. Unlike most SaaS companies who offer a single product, LinkedIn offers three: Talent Solutions, Premium Subscriptions and Marketing Tools. Recruiters buy Talent Solutions to find, connect with and acquire talented people. Salespeople buy Premium Subscriptions to network and search on the platform. And many different types of businesses buy ads to market their products to LinkedIn’s audience. In 2007, the Premium Subscriptions generated 53% of the revenue. Seven years later, the SaaS part of the business, the Talent Solutions part of the business brings and 56% of the revenue and has been the fastest growing part of the business. This, more than any of the data point, is why LinkedIn is a B2C2B. As the amount of profiles on the platform has grown, so has the company’s ability to monetize that data in software. 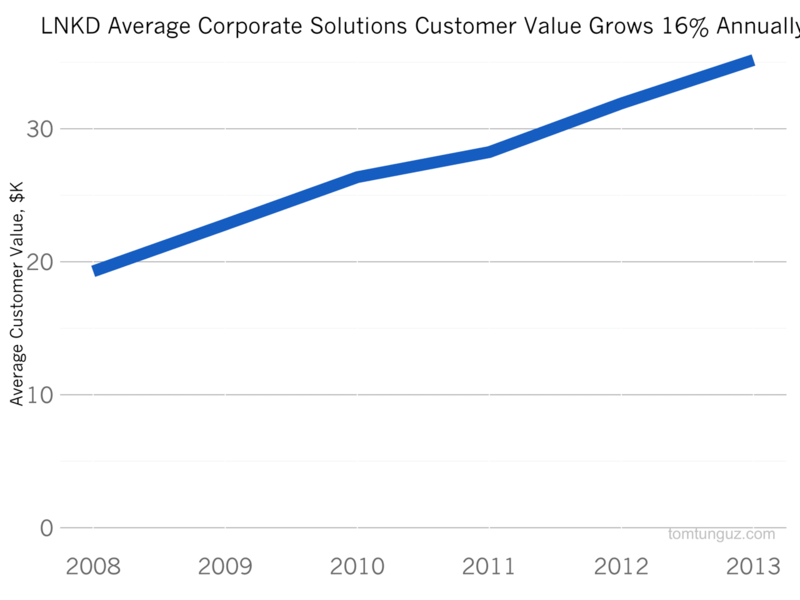 Limiting ourselves to only the Talent Solutions part of the business, we can evaluate the Average Revenue Per Customer over the same seven-year period. In 2008, the average recruiting team spent about $20,000 per year with LinkedIn, a figure that has reached $35,000 in 2013, achieving a growth rate of 16% per year. Meanwhile, the number of paying customers has grown from 900 to about 25,000 in that time. To acquire customers, LinkedIn employs two customer acquisition mechanisms: an online acquisition team and a field sales team. In 2007, online sales generated 63% of revenue. Over the past seven years, the field sales organization has flipped that figure and now represents close to 60% of new business. The field sales teams are probably responsible for the increase in customer value, pursuing larger customers and closing larger teams if not entire recruiting departments. 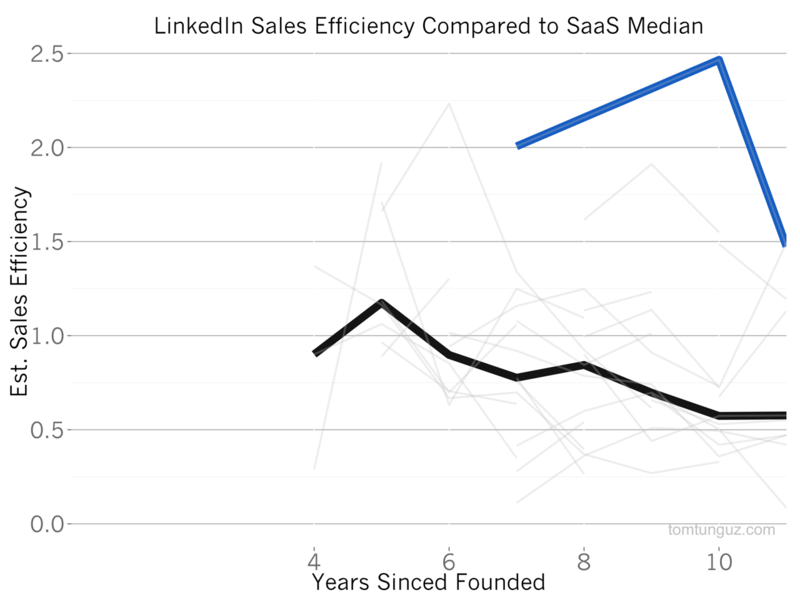 This data suggests that at the beginning, LinkedIn grew primarily through self sign up and other online mechanisms, but over time has come to complement that with a terrifically successful sales team. It serves as a great model for how B2C2B companies can complement their bottoms up strategy with a sales team. Because of the combined online and field sales acquisition channels, and because the company serves both enterprise customers and prosumer types, LinkedIn is able to achieve best in class sales efficiency. It’s a bit of an unfair comparison, considering how much of the business is self sign up, but it stands is an amazing figure. 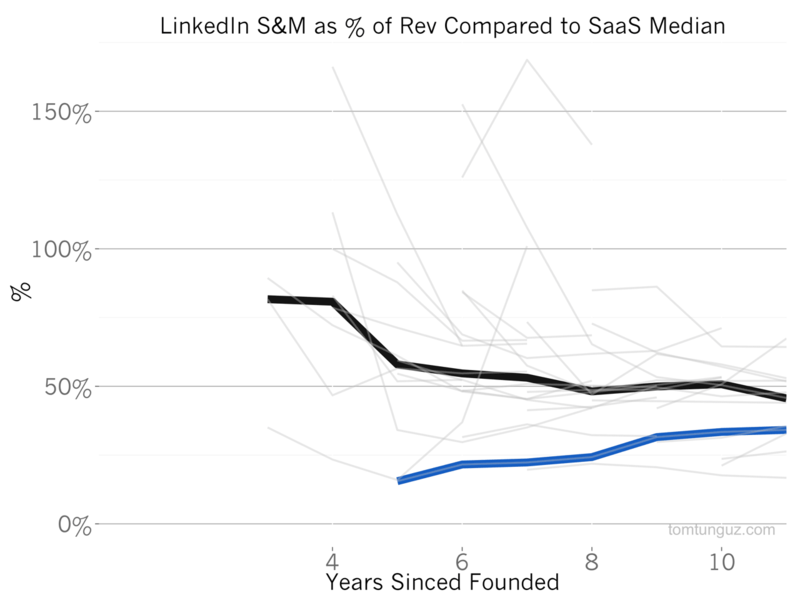 Even more impressive, LinkedIn spent significantly less than the median publicly SaaS company in terms of sales and marketing, which both includes online acquisition and field sales efforts. 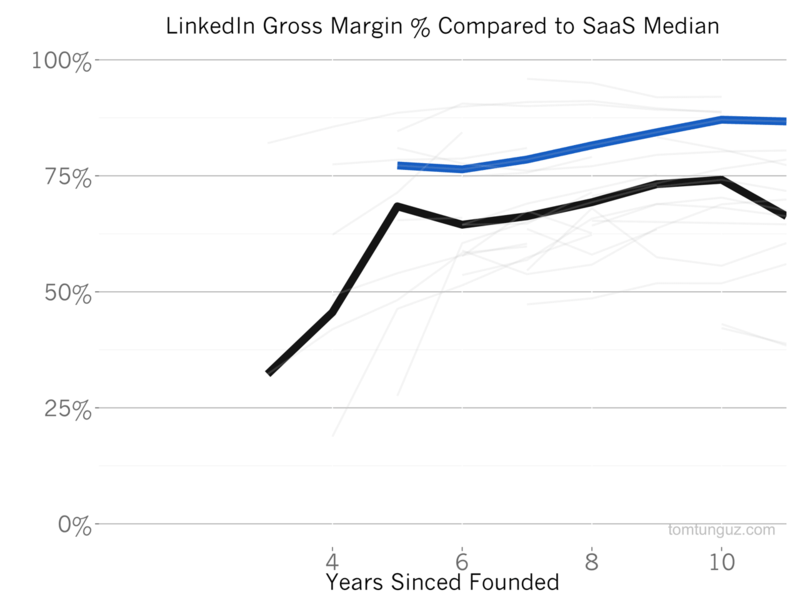 LinkedIn’s gross margin is 87%, more than 10 percentage points above the median. This is likely because LinkedIn’s infrastructure costs and customer support costs are slower than the typical SaaS company. 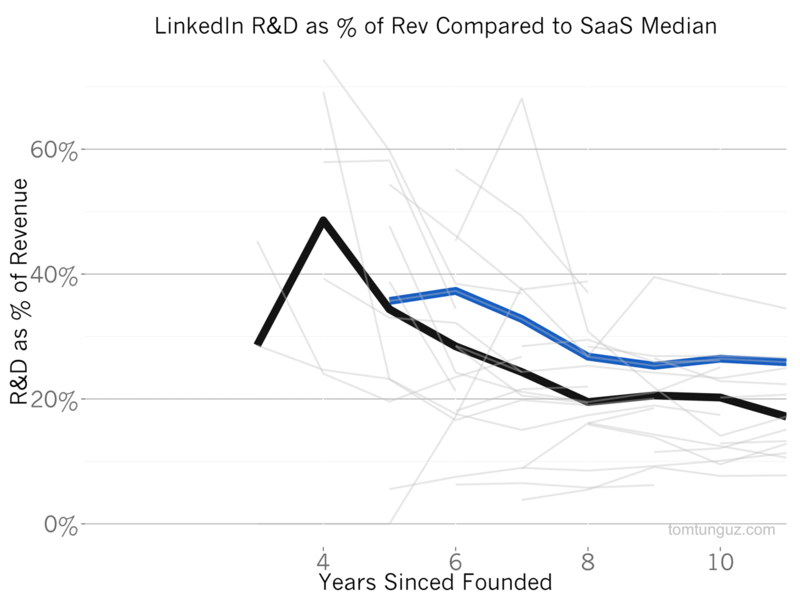 However, LinkedIn does spend more on research and development than the median company (26% vs 18%). LinkedIn has huge amounts of data but more importantly, they must solve some very complex graph problems, for example, search across the social network by degrees of separation, which are very computationally complex. in addition, it’s clear that the company is broadening their product portfolio in order to build to sell more products like Sales Navigator, to increase the average revenue per customer over time. LinkedIn is an amazing company and the biggest B2C2B company on the planet. The sales efficiencies and the breadth of revenue streams it has created are best-in-class and they are a terrific role model for B2C2B startups.